Today, black lipstick is associated with the goth subculture, and, to a lesser extent, some heavy metal bands like KISS and Alice Cooper. However, when badly applied, this lipstick can look tacky and try-hard. If you've ever been to an American mall, you can probably picture such a try-hard in your mind: out of shape, in a large black t-shirt, with black nail polish and unkempt hair. This tragic teenager (or overgrown teenager) has given black lipstick a bad name. Hopefully this person will grow out of their fad, get more in shape, and move on to a better look. So, who does black lipstick look good on? And how can you apply it so you don't look like you're wearing a Halloween costume out of season? First, understand the history of this lipstick color; then, follow my advice. Some tribes, including the Maori of New Zealand, paint and tattoo their lips black. In Hindu tradition, both men and women would color their lips and teeth with betel, resulting in a dark green color. There are many reasons for this type of adornment, from ceremonial commemoration (e.g. the black paint represents the blood of one's enemies) to tribal identification. In Renaissance England, Queen Elizabeth I popularized a proto-goth look of translucent white skin with dark, though not black, lips. Fast forward (yet again) to the 1920s. Color film existed, but was prohibitively expensive to use it in films, especially full length features. 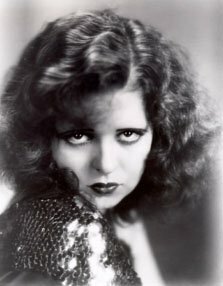 Many film actresses, like Clara Bow, wore black lipstick on set, to accentuate the curve of their lips. This lead to the popularity of very dark red lips. Many women, however, opted for a more natural look, as advertised by Tangee and other companies. In the 1950s, B- to Z-Grade horror movies occasionally used dark lipstick on temptresses. Vampira, a 1950s television horror host, usually wore a mid-tone lipstick with dramatic eye makeup and highly exaggerated eyebrows. At this time, of course, black greasepaint existed, but its usage on lips was not mainstream. It was only in the late 1970s and 1980s that punk, goth and new wave adolescents started inventing new, bold cosmetic looks. 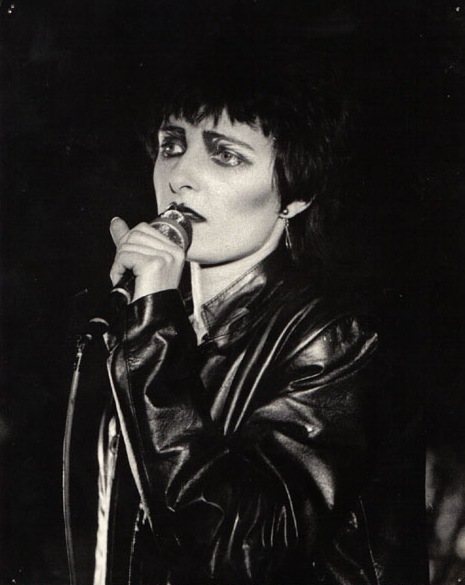 Singers like Siouxsie Sioux (pictured above), Peter Murphy and Robert Smith started experimenting with a new, darker look, influenced by punk rock, teddy boys, and romantic poetry. This look would go on to become "gothic" as we know it today. Black lipstick was one component of this look, though it's not so ubiquitous as we think. Robert Smith most certainly wore it at some point, but most photos of him show him wearing black eyeshadow with red, or dark pink, lips (if he's wearing any makeup at all). For most early goths, the eyes were the focal point of attention, resulting in dramatic and overdone eye makeup combined with relatively understated lipstick. As the 80s turned to the 90s, the goth subculture drifted further away from its punk origins, resulting in acts like Marilyn Manson and Nine Inch Nails, and the birth of industrial music. The focus of attention turned from the eyes to the lips; as performers like Kathleen Hanna and Courtney Love smeared red lipstick over their faces, goths caked their faces in white and their lips in black. Even "modern primitives" borrowed from this movement, with young women with dreads and tribal tattoos wearing espresso or chocolate-covered lipstick to go with their earth-toned wardrobes. Anecdotal accounts suggest that "gothic" individuals predate the goth subculture. My Mom once told me about a friend of hers who, in the mid 1960s, wore all black, drove a hearse, and kept a large poisonous snake in his house. It's not unreasonable, then, to think that some isolated individuals experimented with this look, if only in the privacy of their own homes. Test lipstick before you buy it, whatever color it is. Especially if it's over $5. Why waste your money? Bring a friend anytime you shop for beauty products. A second opinion, which isn't motivated by commission (as some salespeople are), is invaluable. Don't buy something you can't afford. Yes, even if it's really cute. You'll survive. Pale or medium-complexioned people with dark hair. This might be why black is so popular in the goth community, since many goths aspire to the Morticia aesthetic. Some people with this complexion don't like it, though. Di gustabis. Very dark-skinned people. Someone like Alek Wek can pull off black lipstick, especially in a high fashion photo shoot, because it doesn't make her look tubercular or washed out. Then again, Alek Wek can pull off just about any outfit she wants. Young people. Darker lipsticks age most people, except the very young, who look like they just raided Mom's makeup cabinet. Generally, black lips look best on those ages 16-25. Apply lipstick using a brush. This will keep you from overdoing the look. It will also make the application smoother, and allow you to blend it more easily into your natural lip color and lip line. Add black lip gloss, or clear lip gloss, to your lips. Yes, you can buy black lip gloss. This will make your lips stand out even more, and the shine nicely complements the darker color. Use a near-black color lipstick, such as dark red, dark purple, dark brown et cetera. This is especially good if you have a low contrast complexion, where black will make you look positively tubercular. Under-emphasize other parts of your face. Wearing dramatic eye makeup with dramatic lipstick ends up making you look like a clown. Choose one part of your face to emphasize, and stick with it. Want your words to reach thousands of people a day? Write a makeup review for us! It's easy to do. How? Simply visit our Makeup Reviews page and fill out the form. We'll e-mail you when it's published. Above photo from MAC Cosmetics ad campaign.